You may have had a similar experience in your life: on vacation somewhere tropical and eating right on the beach with the rhythmic sound of waves crashing, people frolicking on the sand and that divine feeling that all is right in the world. Yaya's Thai Beach Bungalows in Oslo, Norway aims to reclaim that sensory experience for those stuck in the chilly climes of the Norwegian capital. There are in fact, two restaurants here in the city, both run by a couple of Swedes. I'll get back to that later. "For those unfamiliar with Norwegian prices, this restaurant is practically a steal." Scanning the menu, a short list of appetizers (from 69 to 89 NOK, about $12.50 to $16 US) features Tom Yum Goong soup, salads, fried rice with chicken, spring rolls and King Prawns. Mains ( about 136 to 139 NOK, about $25 US) include green and red curries (with pork or prawns), Penang Chicken Curry, Fish Curry, Chicken Cashew, Thai Noodle Salad with Prawns and Minced Chicken, Thai Beef Salad and Dry Red Chicken Curry. Desserts are pretty simple (59 NOK, $11 US) and include fruit salad, ice cream, fried banana or a pineapple and banana pancake. For those unfamiliar with Norwegian prices, this restaurant is practically a steal. Just after ordering from the efficient waitress, the lights are suddenly darkened and we hear the roar of thunder and rain. My god, they are all about authenticity! We sit in darkness as we await the passing of the flash storm – ah, just like being in Thailand. I tell my Norwegian friend that I have doubts about the spiciness level of the food. How is it that in the land of sweet, brown cheese (admittedly, my favourite Norwegian food), potato salad and endless varieties of bread, that any truly exotic cuisine could exist? She reminds me that it's likely that half of Norway has visited Thailand in recent years. Apparently, with only a population of about 4.5 million, you'd find it hard NOT to bump into a Norwegian on the beaches of Thailand or Southeast Asia during the winter. 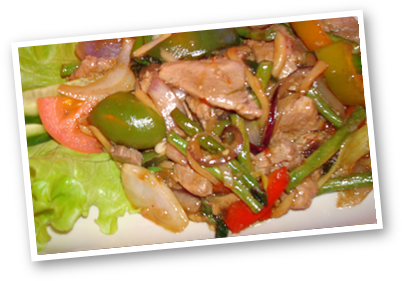 People want to re-create that pleasant experience and they are plenty ready for "authentic" spicy food. She goes on to tell me that the restaurants were opened by two Swedes who went to Thailand a lot and wanted to bring the food back. Their hope was to re-immerse their clients back into the laid-back vibe of Thai beach restos and went back to the country to purchase all the accoutrements that inhabit their two restaurants. As to why the entire staff are Swedes – well, I suppose we all like to hire our own kind. The chefs are both Swedish and Thai and the food is cooked once it is ordered. Nothing is pre-cooked. Dishes arrive promptly, less than 15 minutes from the time we ordered. The very strongly-flavoured Thai Salad appetizer which is peanuty and has a nice blend of carrots, bamboo and basil swimming in green chilis, tamarind and fish sauce. It is fantastically chili-hot and I must admit, I will have to recant those doubts I had about the spiciness of the dishes. Next up we have a basil pork dish that seems to lack enough gooey sauce and that basil-garlic punch that I had hoped for. I also note that the pork pieces are gargantuan and should be chopped up more. What truly saves the night is the Penang Fish Curry, a meaty white fish is cradled in a savoury Malay green curry oozing with deep flavours. Superb. We ladle some of this sauce over our pork. It hits that flavour centre of my heart. I feel at home. Here's a "yeah" to Yaya's. Tel. : 22 83 71 10.